I've been there! And I know that some days it's hard to find the time to get half of your to-do list checked off, let alone learn & set up a new system! What if I told you that I could do it for you? Would you be in? In case you don't know, I'm Chelsea and I help busy, stressed out, and unorganized creative business owners get their systems in order. Sometimes that means putting out a video tutorial you can watch on your own. Sometimes that means holding a workshop to walk you through actually doing a task. And sometimes that means coming in to do it for you so you can stop worrying and get that pesky task off your to-do list. Finally! It's still not getting done! Enter - CBF Done-for-You Services. Hiring someone to come in and just do something (aka - a consultant) is what allows smaller companies to use the expertise of specialists without having to hire someone to their team full time. It's brilliant! A win-win for you - less time & cash out of your pocket + expert knowledge and assistance. I will set everything up for you and provide training on how to use it through private trainings and coaching. HELP ME GET THIS OFF MY PLATE! Maybe you know something needs to change, but you aren't sure what. An audit and/or strategy session is perfect for you! During an audit, I conduct a analysis of your current workflows & productivity systems and provide recommendations for changes and improvements. Then I hand the reins back over to you to implement the strategies we discuss. Audits typically take several weeks to complete, but with minimal time from you. During a strategy session, we hop on a call where you share your goals, your struggles, and your current strategies and I provide recommendations for next steps and how to get to your productivity goals. These are 30 minutes, but can have a huge impact on your business. No matter which option you choose, I want you to walk away from our time together knowing that you have the power to make your business match your dreams. You've got this! Show me what to do! I was always the kid tinkering with a new tech toy or computer program. My parents tell me that as soon as I could walk, I was programing the VCR (remember those?!) and reconnecting all the wires behind the TV. I taught myself how to use Microsoft 93 (including installing new fonts) when it was still brand new - my dad didn't even know how to do that (or not that he told me, anyway). In college I used Outlook (the email provider used at my school - and a few years before Gmail took off) to organized my entire life. I had color-coded calendars for each class (usually 5 or 6, plus labs), each job (usually 2 or 3), and my social life. I was able to manage and excel even with a full load of classes and multiple jobs at the same time. I taught myself graphic design, first with Microsoft Publisher and then the Adobe suite and then built a successful graphic design business with these skills. I'm known for my organization skills, my attention to detail, and my desire to always find a better way of doing things. In fact, my hubby and I geek out of productivity apps and hacks. He's the co-founder and CEO of Zapier, so of course our dinner time discussions often find their way to the topic of new apps that just came out or apps that are really rocking it for entrepreneurs. 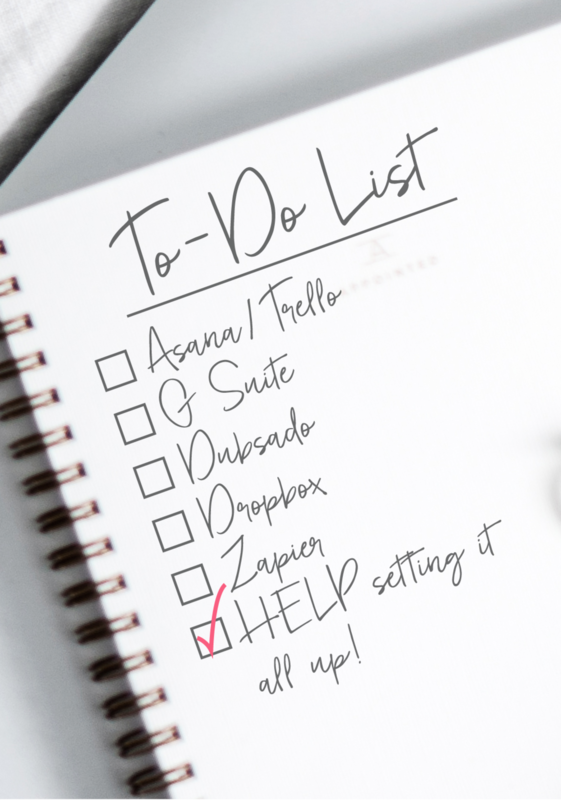 Ready to get these tasks off your to-do list?